"Workers of the Maine Slate Company of Monson "
A black and white photograph of six men standing at the bottom of a shaft where slate is being harvested. This photograph is one of ten included in the Maine Slate Company of Monson records. 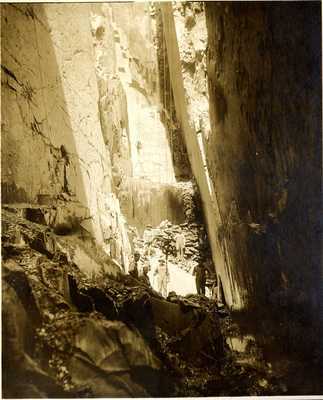 The Maine company opened its quarry in 1903 three and a half miles west-southwest of the village where there were about 30 feet of slate and interbedded quartzite exposed.